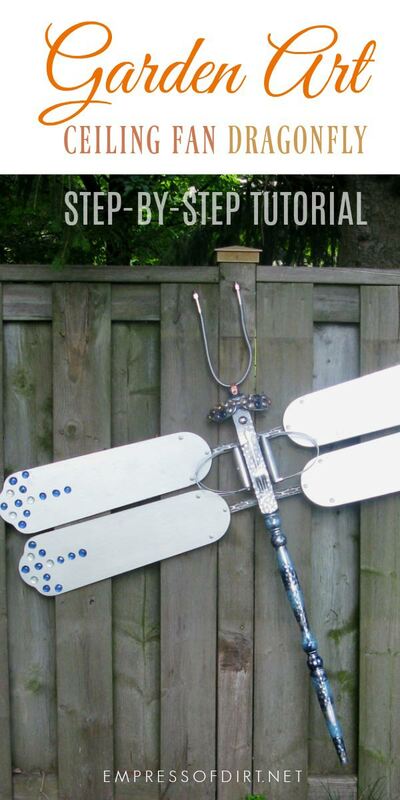 Make a garden art dragonfly using an old ceiling fan and various other household supplies. 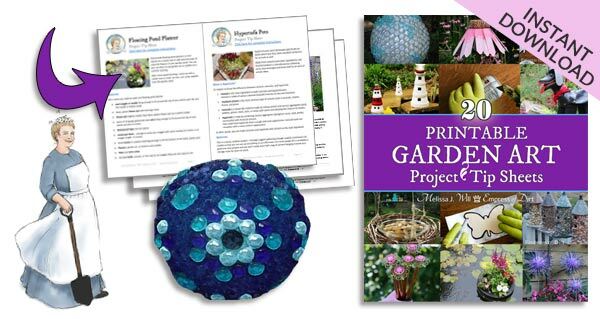 For more, see all of the garden art project tutorials here. 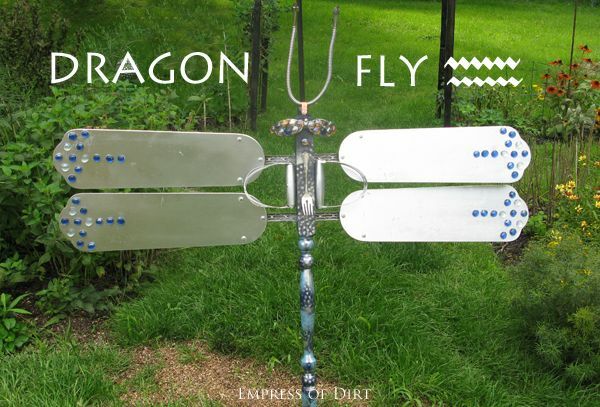 There’s only one rule for making garden art dragonflies: no two can be the same—even if you want them to be! 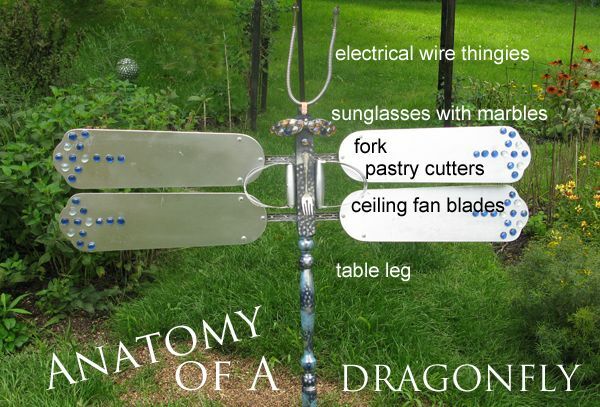 With a few easy-to-find household items and a screwdriver, you can make your own dragonfly. The supplies for this one cost around $7. Antennae: Any thick wire that will bend and stay in position. I found mine in the electrical section of the thrift store. Eyes: I used sunglasses with flat-bottom marbles glued on. Drawer knobs or metal egg cups would also look good. Details: I added two pastry cutters (to echo the wings) and a kitchen fork (like a tongue). Embellishments: Flat-bottom marbles, costume jewelry, glitter, kitchen utensils—anything goes. Paint: Any spray paint or exterior wood paint and polyurethane. There’s not a lot to this. You just need to paint the pieces and have a way to attach them together. Everyone’s dragonfly is going to be different, depending on the parts you are using. Remove fan blades from ceiling fan. Paint if desired. It’s easier to do this before assembling your dragonfly. Paint body (table leg). For long-lasting results, sand, prime, and use exterior paint or spray paint (some do not require priming). I used one of these kitchen tools as a stencil to create polka dots on the dragonfly body. Just aim the spray paint through it. Attach fan blades to body. Use 1/2-inch wood screws. Predrill holes with fine wood bit to avoid splitting wood. Attach antenane, eyes, glasses, and other embellisments. Use GE II Silicone Sealant as adhesive. Touch up paint and add final embellisments as desired. Apply exterior polyurethane or similar wood sealant for a more weather-resistant dragonfly. Attach hanging hardware to back of body. Hang on a fence or house wall using picture hanging hardware. Suspend from a tree branch with chain or wire. Hi. I love tthis idea. I’ve had a difficult year and a half. Divorced my husband and I bought myself dragonfly earrings because dragonflies represent “freedom”. I absolutely Love this idea but about the ceiling fan wings; if these are supposed to be “outside” aren’t you supposed to spray paint them with a “sealant” in order to keep them from warping? I’ve had an “inside” ceiling fan Outside before & the /blades warped within weeks… Polyurethane is highly recommended for an extensive stay of the Dragonfly. You can certainly seal outdoor projects. I’m actually fond of a weathered look so I tend not to. In the case of the dragonfly, I happened to use spray paint that had protection built in. How well the blades endure the weather will depend on how they’re made and the paint/sealants used. Thanks for sharing this wonderful Dragonfly!!!!!!!!!!!!! Thanks! I’ll have a look.